Marks 2 Dimensions 31 in. x 11 in. x 12 in. The CPS 4100 is an all around great gun. It has four nozzle settings with different ranges and soakage. 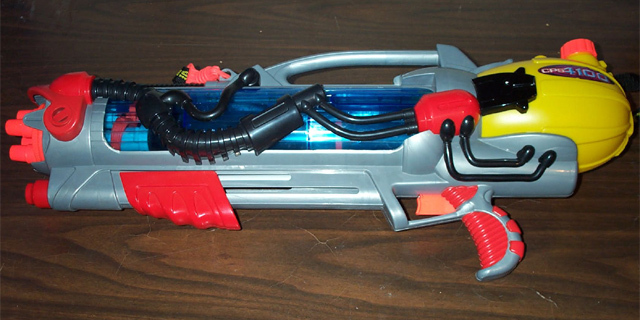 One of the things that disappointed me about this soaker is that the trigger was so weak. I like the slick design of this soaker, although the colors could have been better. The range on the CPS 4100 is great, but I do not recommend this soaker for sniping because it is heavy. I recommend that you keep this soaker on the 8.5X setting and have your grunts use it. Another thing that disappointed me was the water capacity, in the commercials they made the water tank look huge, but in real life it is small. The 8.5X blast drains half of your water. The CPS 4100 is prone to have a snapped trigger. We highly recommend strengthening the trigger by performing the Snapped trigger repair to prevent a potential break.